What do you get when you combine award-winning chefs from both sides of the border with authentic al fresco cuisine and lavish Mexican vineyards? You get a delicious experience that can only be perfected by the “Best Chef of Baja!” With incredible Valle de Guadalupe only 90 minutes from San Diego, it would be a shame to miss out on the El Jardín Dinner on Friday, May 29, which embodies the rich culture of the region. 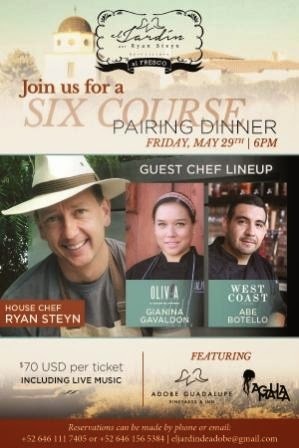 World renowned Chef Ryan Steyn of El Jardín is joining with well-known guest chefs Gianina Gavaldon from Olivia in Guadalupe Valley and Chef Abe Botello from San Diego’s West Coast Tavern, to offer an unforgettable six-course dinner paired with some of the finest sips of Guadalupe Valley and live music. One bite and you will instantly recognize why Chef Ryan Steyn was named the “Best Chef of Baja” by Cocinero del año Mexico. This intimate south-of-the-border feast will take place at El Jardín beginning at 6pm and each seat will cost $70 US per person. In true Ensenada fashion, brews from burgeoning craft microbrewery Agua Mala Cervezeria and vinos from the surrounding vineyards of Adobe Guadalupe will be paired with each bite. Not to mention there will be live music to accompany the meal. Owner Chef Ryan Steyn is no stranger to the delicate tastes of the region; he teaches at a gastronomic university in Ensenada, and owns a cooking school, “The Cook Book Ensenada.” This prized chef thoughtfully sources organic, fresh local ingredients to celebrate dishes unique to the Valle and this six-course meal is fit to satisfy even the most discriminating palate. Reservations can be made by calling 011526461565384 or (646) 111-7405, or emailing eljardindeadobe@gmail.com.